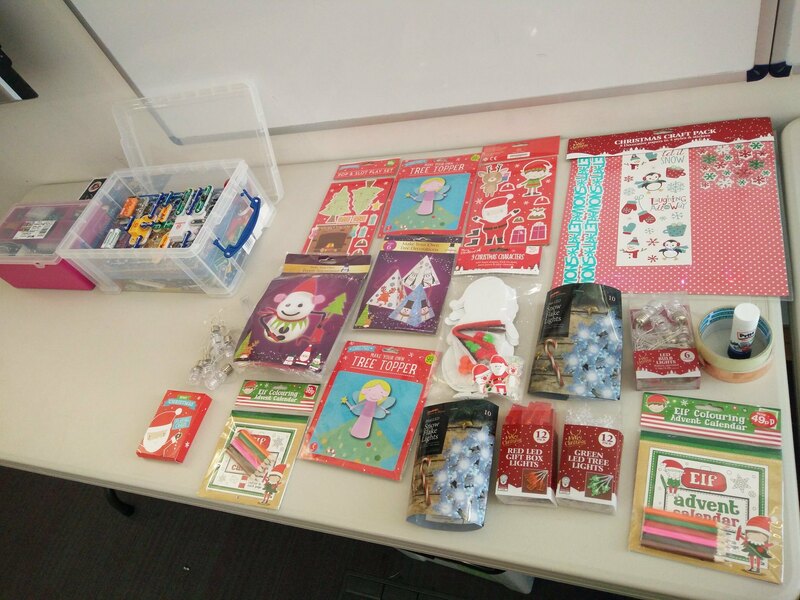 We had plenty of stuff to hack this month! "A new toy for Father Christmas"
and WOW did they make some cool projects. "C" made a great Crumble controlled Christmas decoration, which used a Crumble micro-controller (it uses a block language similar to Scratch) to control a string of small LED lights placed inside the scene! 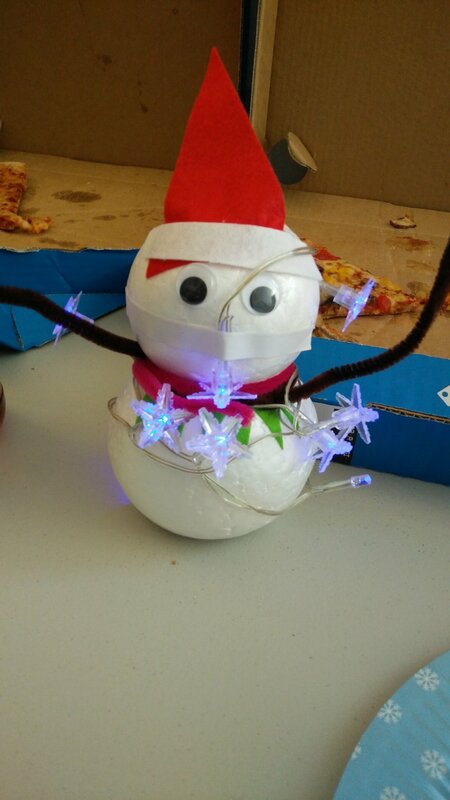 "D" made a fantastic snowman which came with his very own wearable tech, in the form of a string of LED lights to keep the snowman safe in the dark. He also protected the pizza...! "E" and "M" made their very own sound reactive Christmas decorations using Hot Wires (also known as Snap Circuits) and a string of Poundland LEDs. "M" also had some homework, and spoke to Les about who Ada Lovelace was, and what she accomplished in the field of computing / programming. "M" now has plenty of information to show in class this week. 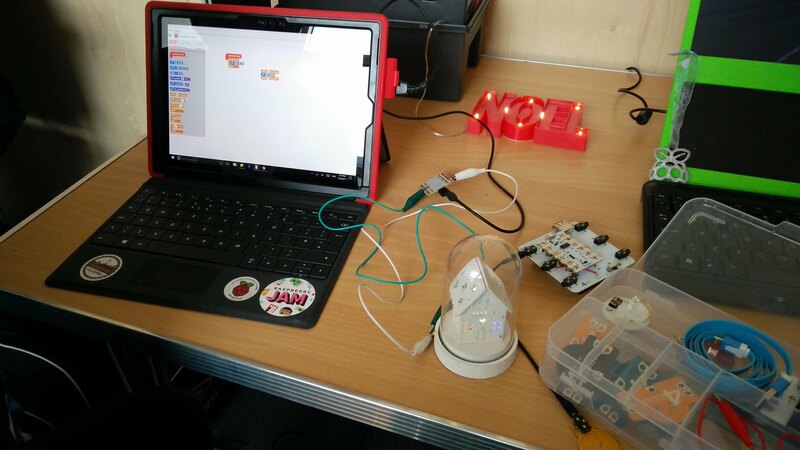 "G" Learnt how to use neopixels with the micro:bit and the Codebug boards! "N" created a Python script that hacked various departments...don't worry it wasn't real, rather a Python script that printed a random entry from a list and then used concatenation to join that to a randomly generated number. To say thank-you for everyone's hard work, each child received an early Christmas present in the form of their very own makers kit and a specially created laser cut Christmas bauble! Have a lovely Christmas / Holiday and we shall return in 2018, January 13, 1pm at Palatine Library. Tickets and details to follow!